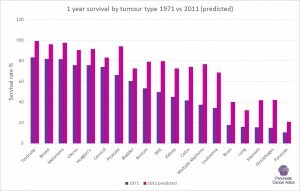 A study, published in The Lancet on 3rd December 20141 has shown that for most cancers, there have been substantial increases in both short-term and long-term net survival over the past 40 years – the exception being pancreatic cancer, which has shown no improvement in long-term survival (more than 5 years) since 1971. 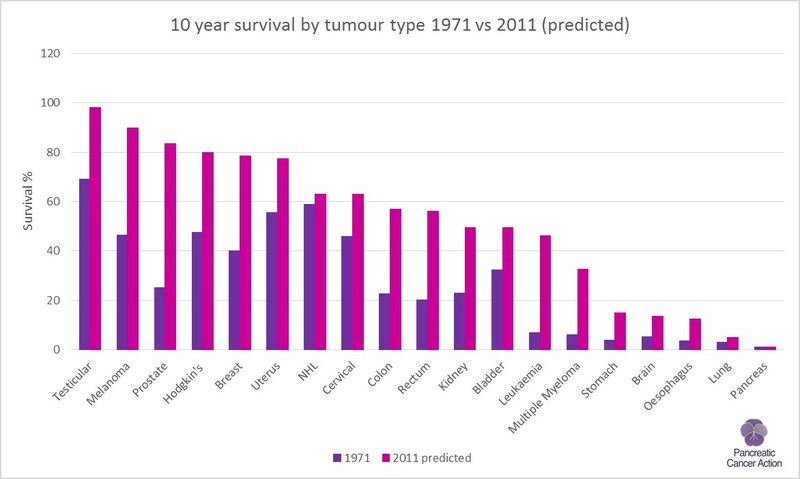 The researchers from the London School of Hygiene and Tropical Medicine analysed trends in survival using population-based data for 7.2 million adults diagnosed with cancer in England and Wales during 1971 – 2011 and followed up to the end of 2012. 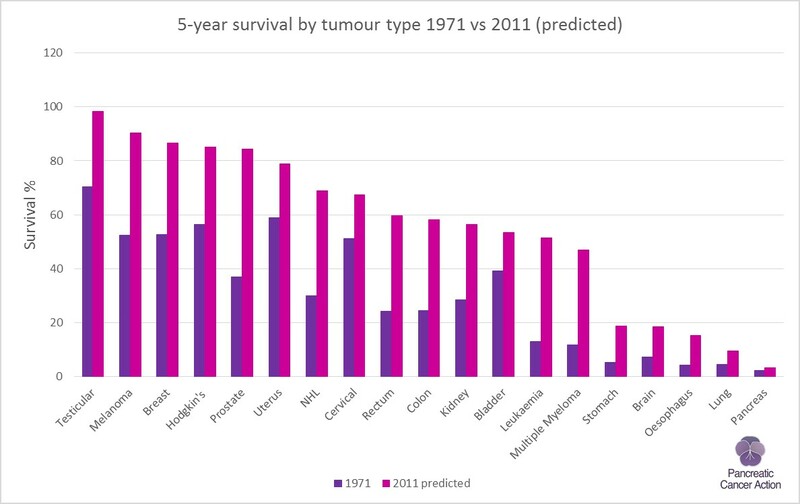 They found that for all cancers combined, for patients diagnosed in 1971-1972, the index of net survival (survival after taking account of death from other causes) was 50% one year after diagnosis. Forty years later, the index of survival after 10 years was predicted to be 50%. The survival index for all cancers combined was 10% higher on average for women than men at each interval since diagnosis and can be attributed to the vast improvements in breast cancer survival which accounted for nearly 1/3 of female cancers. Where in 2011 (predicted) cancers had high survival and the increase in survival since 1971 had been progressively larger at 1, 5 and 10 years and included breast, prostate, testicular cancers, melanoma and Hodgkin’s disease. Cancers with a moderate survival (64-84%) in 2010-2011 and smaller increases since 1971 and included cervical, colorectal, bladder, ovarian cancers, multiple myeloma nd Leukaemia. Survival for these cancers is still low in 2010-2011 and where little or no improvement has occurred in the past 40 years. This group includes cancers of the pancreas, brain, lung and stomach. 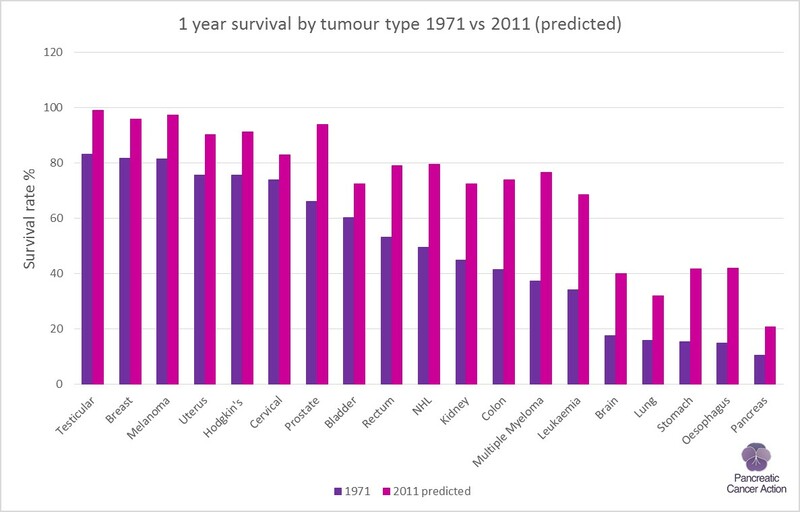 It is disappointing but not altogether surprising that we see pancreatic cancer languishing at the bottom of the heap with virtually no improvement in long-term survival over the past 40 years. However, we do see an improvement in 1 year survival for pancreatic cancer from 11% in 1971 to 21% in 2011 which is encouraging. This study shows though that there is still a need for earlier diagnosis – at the point where surgery is still an option, for us to see a shift in long-term pancreatic cancer survival in the future.